Born January 9/1998, this 8 year old has some very distinct habits he enjoys, thanks to Jungle Wear Birdie Diaper. He is very socialized and well mannered, he likes to be picked up by just about anyone wanting to play. Unlike many grey’s he loves to be with people and is very gentle when being handled. This can be attributed to his early socializing with many people thanks to wearing his diaper as a ritual. Up at 7 am, he methodically rings his bell and calls 'Mom' for me to uncage him. Then we do a practice flight in hand on the way to the bathroom. (Yes you heard right, Alex is potty trained and wont soil in his cage). He poops on the toilet, then lifts his leg to be picked up. Then it's on with the suit (see easy to handle bird video located under the HOW TO DIAPER page) and he's ready for another day of adventure. Every day is exciting with our little critter tagging along. The suit is changed in mid afternoon and he's then good until bedtime when we remove the diaper for the night. This 25 year old Cherry Head Conure has a mind of his own. I acquired him while selling Birdie Diapers in my home town. 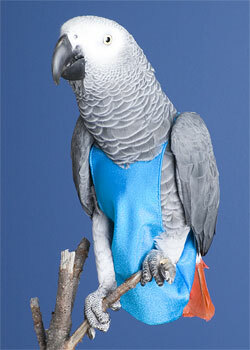 His owner wished to purchase the suit to coverup and hopefully allow his missing plumage to regrow. Unfortunately, the owner didn't take under consideration that Coco was an untamed parrot, not tolerating any form of physical contact with the humans in his world. Concerned that this would be a hopeless effort, She asked me to adopt Coco as I already had Alex my Grey. I couldn't refuse when I heard the life this little plucked bundle had lived. Ten owners later and many dark closets made for a very anti-social companion bird. Although still difficult to handle, we love him very much and want to give him the same privileges our other bird has. Therefore at 7 am, Coco is toweled out of his cage. He has learned to step up, but not usually until he has drawn blood. So towels are good. Then it is dressing time using the technique for (Difficult to Handle Bird Video located under the HOW TO DIAPER page). Surprisingly, he is very happy and does not protest once dressed. The trick is to get the garment on the bird without being eaten. Following the technique on the video and a little practice will make you the master of diapering any bird. I haven't met a bird yet I couldn't diaper successfully.